The struggle of no Legendary Hector or any Grandscratcher… I’m trying to make a easy 1 turn galefore build and Navaree with his pulse sword has some potential. I plan to pair him with another WoM Galeforece user and a WoM dancer. The idea is to abuse damage traps in AR, get simited in then get a kill and activate Galeforce. Depending on the damage from the trap, activate WoM from teammates to spam more Galeforce. I am thinking of also giving him 1 charge from an infantry pulse teammate. Looking for suggestions or ideas from these 2 buids. Nothing is set in stone yet. Edit: I really want to avoid using QP seal. Ah, Galeforce. My favorite AR strategy haha. I think Navarre would be great for that, since he only needs 1-2 hits with his sword to trigger the special, depending on pulses. Your builds look good, I only have a few suggestions, based on personal experience. If you want to run dual Galeforcers, which is a great strategy, then I suggest giving Navarre WoM as the secondary attacker, and using a calvary or 3 range beast hero as your lead Galeforcer. This is because you need the 3 movement range + Smite to close the gap on ranged calvary, which are pretty common in AR. Either way, definitely give it a shot if you’re interested. It’s a very fun strategy, and it’s one you can hone over time in your own way. Solid advice, heres a potential main Galeforce user to put Navaree as the 2nd. If I went with him, Id go the Death blow/Wom/attack tactic build with Navaree. EDIT: ehhhh, cant reliably galeforce if I desperation kill. Then again, the dancer could redeem this. 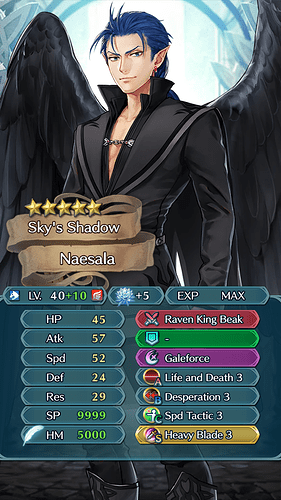 That is a strong looking Naesala! He’d be a great lead Galeforcer for sure. If you could pulse him somehow, it’d be perfect. But even as is, like you said, you can just dance him for an almost guaranteed Galeforce on the next attack. Only issue would be if you OHKO two squishy mages in a row. In that case, my only other suggestion would be to try to put the tactic skills on your Smite hero or other non-galeforce heroes, to free up room for smokes or something. Then again, you may not need extra debuffs, in which case the tactics look good. Seems like a solid start to a team, they’ll probably do fine even at low merge levels, if you don’t want to invest 100% right off the bat. I’m thinking about changing up my Galeforce team as well (been using L.Eirika as my lead, which is great except for non-water seasons). So I may experiment with some of your build ideas too haha. I’m curious about Naesala especially. If you attempt any let me know how they go. I’m still on the edge of what I want to do. Here’s another option I just came up with. Stats are solid but her weapon has so much additional effects, when alone and transformed +5 attack/+3spd def and res. Then debuffs the enemy 4 attack and def during combat. 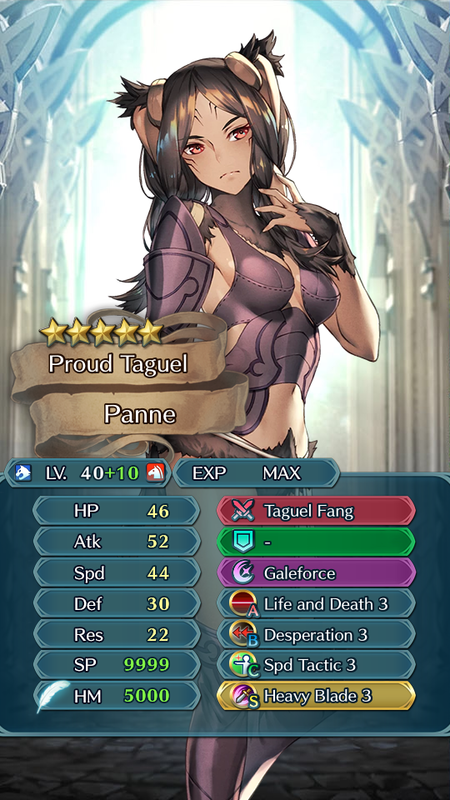 Giving an effective 61 attack for heavy blade (when factoring her buffs and their debuffs). Edit: or even swift sparrow to not compromise bulk, which she deceptively has with her combat buffs. Yeah she does have good bulk for an offensive calvary unit, swift sparrow would be nice. And her in-combat buffs/debuffs would work well for a Galeforce build. Naesala is good for the flier movement and speed, but Panne is almost as fast, with more attack for heavy blade. The only downside to those two are the special charge I think. Can’t think of a great way to pulse them for my teams. 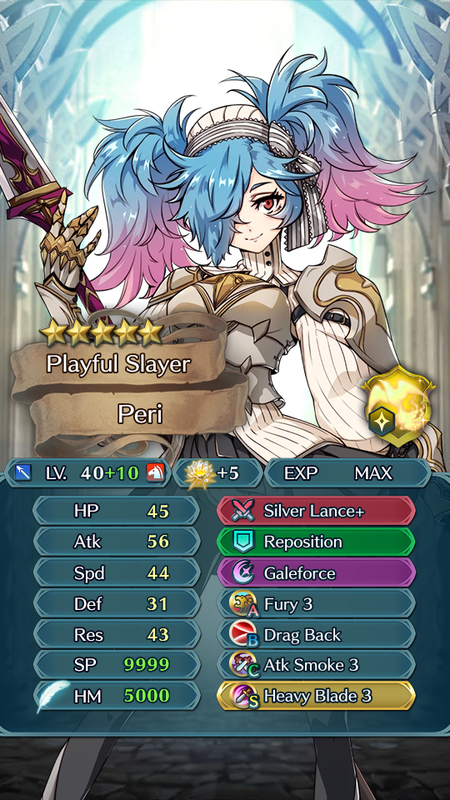 I was thinking about trying Peri’s new refine. After taking damage, she’ll have 60 attack and 48 speed with Fury. 62/50 with LnD before buffs. Plus her accelerated cooldown. 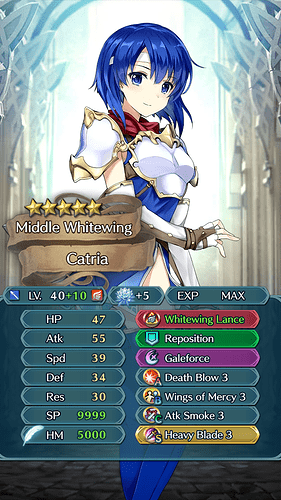 Overall seems like it could be a perfect refine for a Galeforcer. The only thing I’m not crazy about is her character/personality, but she has good potential otherwise. Edit: Silver Lance + is meant for her new refine, just didn’t see the option. And Dragback vs desperation depends on the situation, wish I could have both haha. I’ve become a bit disenchanted about galeforce in AR in recent times. I’m seeing more teams that use tanky units with high atk that either chunk my galeforcers really hard (and leave them in OHKO range of dancers or other weaker units) or cover the galeforcers’ entries with traps and cover the traps with stuff like firesweepers. And I agree with all your WoM advice unless spd is not high enough, in which case something like L&D should be considered. What do you consider to be a good atk value for a red galeforcer? I once said AR galeforcers want around 55-59 atk and I still think 59-61 unbuffed is still a really good number for a red because unmerged L&D Ophelia sometimes has 50 physical bulk. @MiThiKaL If you’re not going to infantry pulse him for a one-hit galeforce, then I think Lon’qu might be better, because 50 spd is where I think we can start to feel secure. Also, unless you hit a bolt trap or something you cannot miss a galeforce activation due to desperation. By the time you activate desperation, galeforce should already have activated. Hate to hear about your disenchantment with galeforcing, I always enjoy seeing your AR posts and insight. Hope things turn around for ya, the meta is always evolving, for better or worse. But yeah unfortunately there are some defenses that are very difficult, and maybe impossible to Galeforce without losing a unit. But, if you have enough WoM follow-up, you can usually either trap one or two ranged enemies, or repo your galeforcers to safety. Dragback is useful for this too, as it can get your unit back in range of a dancer, or out of range of the last surviving enemies. It opens up new options at least, although sometimes it works against you, as you may end up too far from an enemy to continue a WoM chain. Situational, but usually more helpful than harmful. As far as how much attack is needed, I’d agree that 55-65 is a good range. My L.Eirika has 56 unbuffed with Fury when she’s not a bonus unit, and that’s usually enough to handle common armors like Duma, while not OHKOing every squishy mage. But as said, I’d like to eventually replace L.Eirika during non-water seasons, plus I eventually need a whole new Galeforce team for Astra season. So I’m curious to try out new heroes and strategies at this point. Thanks. I actually said that because I was wondering if you had any ideas to offer in return, and you did offer some ideas. My idea has been that if they keep their traps that tight there’s probably some way to can-opener them with Ophelia or some other ranged unit and then use the vacated square for the galeforcers, i.e. galeforce starts activating behind the trap line. I’ve done some collaborative work with people here. Want to write an AR galeforce guide together? I like the can-opener idea, and it might be the only option if you can’t safely bait them away from the traps. Honestly, I’d love to collaborate on a guide, as I’m about to have more free time for it. Plus, I respect the hell out of your other work on the forums Feel free to PM me whenever you want to start working on something like that. That peri looks nice, especially with her refine. That would work well with the trap bait and desperation. It hurts to think about the amount of Peri’s I’ve thrown away now. I think I have 6 left still. 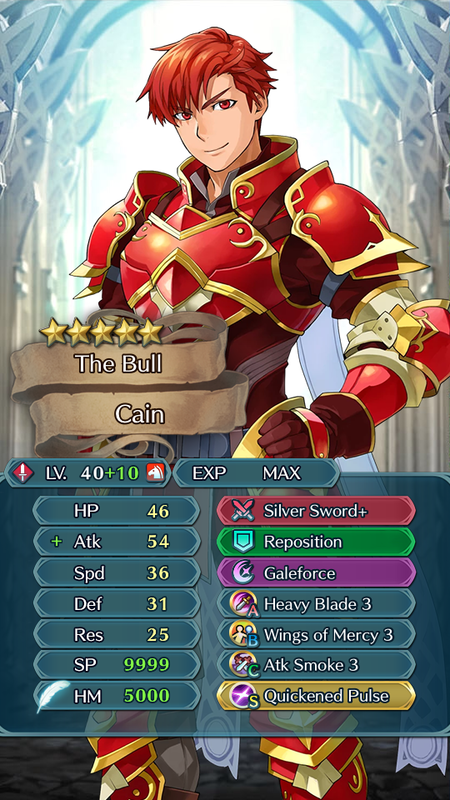 Just came up with a good pairing to Peri (or any galeforce calvary), with Cain’s refined effect he will have the brave sword effect since he’ll be WoMing in beside Peri. His effect also grants him an additional 2 attack and defense, if necessary Peri could run drive or spur attack. Talking to myself at this point but I think she may be one of the best options as a 2nd Galeforce. Unfortunately Blue units seem to be my best option as a primary also. Her Slaying Brave 16mt weapon is pretty insane, Id consider Sturdy Impact if I had it. Anyway she has an easily repeatable 1 turn Galeforce build. Most seem to work first then arent as consistent. Nice, I like both of those builds. I’ve thought about Cain too, but didn’t initially like Heavy Blade + quickened pulse. 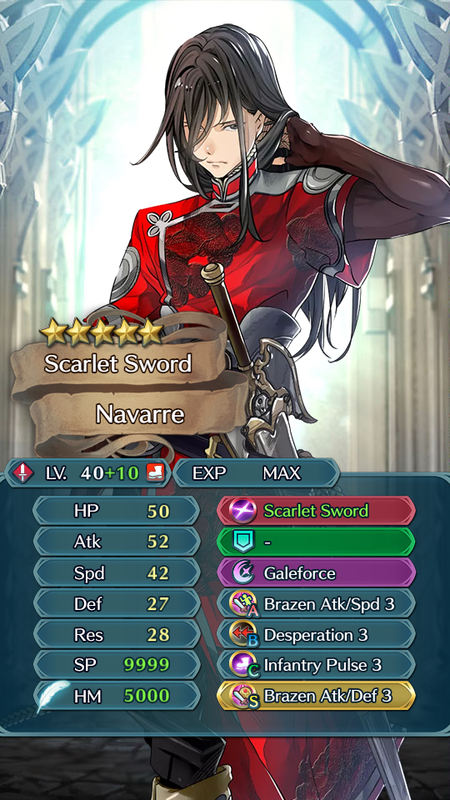 Now that I see him at +10 though, I think it would actually work pretty well, and would be a nice compliment to all of the good lance cavaliers. Especially if your lead Galeforcer already laid down attack smoke, then I think he would have enough attack for Heavy Blade in almost all cases. Catria also looks really formidable. It isn’t usually necessary in AR offense to Galeforce more than once per hero, but sometimes it is, after a hit and run situation. Definitely doesn’t hurt, and would be useful for other types of content too. It’s also not terrible to have two blues, but in that case, you may want a strong red dancer to help out with things like Surtr and L.Hector, who are fairly common on balanced defense teams. Although, sometimes you can leave them alone, and swarm them on the following turn. However, I’d personally try to have some color coverage, since you sometimes want color disadvantage to prevent OHKOs on squishy mages. Most of all, I like your last two ideas, due to the brave weapons. Seeker mentioned how useful they are with B.Celica, and it gives a nice option vs. Wary Fighter and super fast enemies. Personally, I’m now leaning towards Peri + Cain + Olivia, but I may well change my mind again haha. EDIT: but I only have one Cain, which will probably become more WoM fodder, so nevermind lol. One day though, I’ll build him up.